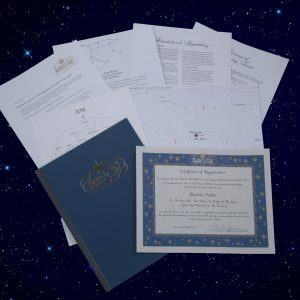 Name a Star Memorial Star-Naming Packages are dedicated in honor of your loved ones who have passed away. These packages are similar to Name a Star Custom Gift Packages but the stars chosen will be visible all year. Certificate of Registration. Each Certificate of Registration is customized with a personal message or tribute you write. 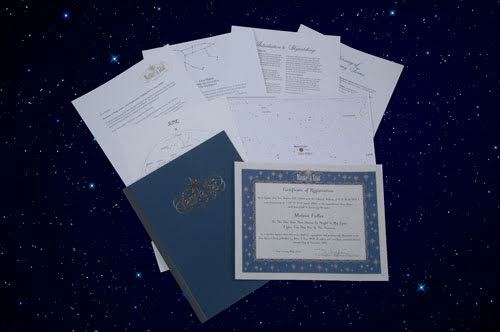 Star Charts marked with the location of the star, so you can find your loved ones star in the night sky. A star chart showing the constellation in which the star is located along with the celestial address of the star. 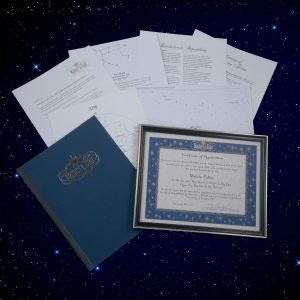 The Custom Memorial Star-Naming Package is $49.95 plus shipping. Great products and timely service. 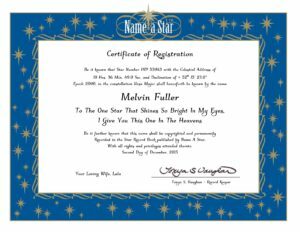 My wife really loved the certificate and the fact that she has a star named after her. I have owned a home health agency for years and we care for very sick disabled children. Sadly, from time to time, some of these beautiful children succumb to their illnesses. We have found that sending the parents a Memorial Star named after their departed child brings them great comfort. Name A Star has always delivered sensitive packages to us to give to the families. And knowing how much our nursing staff also suffers from the loss of their long-time patients, Name A Star has gone the extra distance and provided an extra certificate in the child’s name that we hang on our memorial wall in our office. 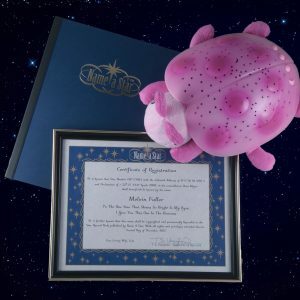 Over the years, it has brought us great comfort to look at these star certificates named after each child that has passed on. Thank you, Name A Star for your timeliness and caring attitude whenever we contact you. It’s so wonderful to do business with a company that actually cares about their customers and strives so hard to please us. Thanks for the heart warming comments. They brought tears to my eyes. I have purchased five or more of these packages, all in memory of a loved one, and each time the gifts are received with much appreciation and has brought a sense of peace to many as they now feel their loved ones are watching over still. The packaging is awesome, professional and delivery always on time. Thank you for re-doing the error that we made on our certificate. Excellent customer service, as usual! Your certificates are absolutely lovely! Absolutely awesome!!!! Cant wait till xmas to give to person i ordered for. Im going to matt and frame first. So beautiful and proffessionally done. They are going to be so happy. My sister-in-law, who truly was a shining star, passed away recently. My brother loved that I named a star in her memory…we are looking forward to finding it in the sky!